A Little Magic for your Lips! Badger's dreamy, creamy lip balms feature rich, Certified Organic and Fair Trade Certified Cocoa Butter, which has the sultry fragrance of dark chocolate. Badger's Cocoa Butter is traditionally processed at low temperatures, allowing the butter to retain its natural, health-giving properties. Flavoured with all natural steam distilled essential oils - no artificial sweeteners or fragrances. Base Ingredients: *Theobroma Cacao (Organic & Fair Trade CertifiedTM Cocoa) Butter, *Olea Europaea (Organic Extra Virgin Olive) Oil, *Cera Alba (Organic Beeswax), *Ricinus Communis (Organic Castor) Oil, *Aloe Barbadensis (Organic Aloe) Extract, and CO2 Extracts of *Rosmarinus Officinalis (Organic Rosemary), *Rosa Canina (Organic Rosehip), & *Hippophae Rhamnoides (Organic Seabuckthorn). Other Ingredients: Essential Oils of *Mentha Piperita (Organic Peppermint), *Mentha Viridis (Organic Spearmint), & *Citrus Aurantium Dulcis (Organic Sweet Orange). Bought my first tube awhile ago, and love how long my lips stay moist. You need to buy this product!! I have suffered with dry lips all my life, and this is such a huge improvement! Buy it! You will not be disappointed! Literally my favourite lip balm in all the land! Wish I could just buy a case of it to be honest because nothing has really compared. It has a great smell, awesome tingle on your lips, smooth glide, AND comes in a 7g tube. NOT for anyone who doesn't like the tingle or smell of peppermint though! I love the cool hit of peppermint and the cocoa butter is so smooth! It lasts a long time on my lips. The Badger Balms use olive oil which is great If you are allergic to the sunflower seeds/oils used in other lip products. This product is the bomb! I love it. No matter which flavour it is, it is just the best. Goes on well , lasts a long time, and keeps lips hydrated. I like these lip balms. This balm glides on well, lasts for a long time, doesn't dry out my lips and it has a simple formula. The reason for the 4/5 rating is that I don't love the peppermint (I find it unsettling and it doesn't smell as good as the Vanilla option). Love this lip balm! Keeps my lips moisturized and doesn't cause any type of breakout. Love this product. Cool minty on the lips without being over powering and makes my lips feel soft and moisturised longer than other brands. I really like this lip balm. It works well and makes my lips really smooth. The chocolate mint tastes/smells a bit funny (maybe because I'm not used to chocolate mint lip balms) but other than that, I think this works great and is very moisturizing. The size of the lip balm is actually quite bigger than expected as compared to normal chapsticks that are sold. I kind of like this flavour. It goes on very smoothly. Size takes a bit getting used to, but it's all good. I really love cocoa butter lip balms, so I was a bit sad when this didn't work out for me. The mint dried out my lips something awful! I guess I'm just sensitive to mint oils, but I didn't have this problem with my last mint lip balm, so I'm guessing it was the concentration in this one. Great lip balm but I wouldn't pick the mint flavour again as the smell is a little too raw. The cool orange flavour is much better. 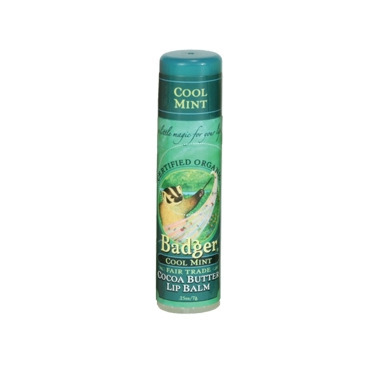 The cool mint badger balm has really kept my lips soft & smooth. I also find that I don't have to use us it as often as other lip balms. The mint gives that little bit of tingling that I like to have in a lip balm! Great product!!! This is the nicest lipbalm I have ever used, minty fresh without being too minty so that it won't sting your lips, and very moisturizing smooth and creamy due to the Cocoa Butter. This is a very X-Large tube of lip balm, so it's reflected in the price but will last you for a very long time. Well worth the money for the quality. You only need 1! Definetely a thumbs up! Lasts long, feels and smells great. I love all badger balms! Wonderful lip balm, it is an unusually large tube, lasts for months. Wonderful blend of healing oils. It's a thumbs up!